Heat oven to 350°F. Spray 12x8-inch (2-quart) glass baking dish with cooking spray. Cook and drain pasta as directed on package, using minimum cook time. Meanwhile, in 12-inch nonstick skillet, heat oil over medium-high heat. Cook onion, eggplant and zucchini in oil 5 to 7 minutes, stirring frequently, until crisp-tender. Stir in tomatoes and tomato sauce. 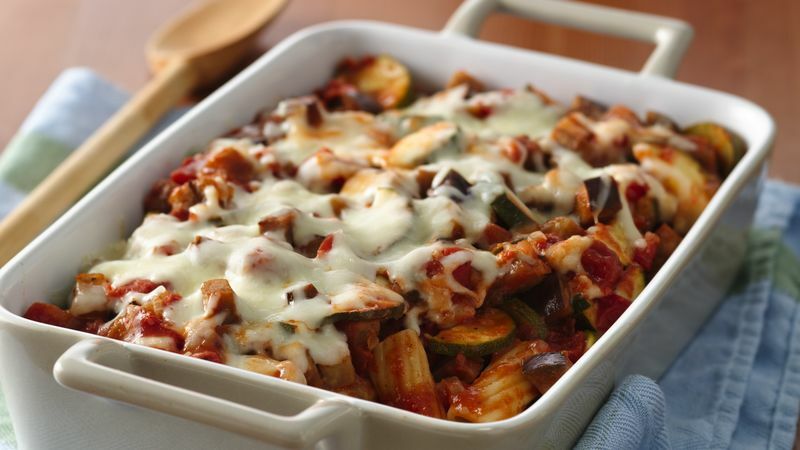 Spoon cooked pasta into baking dish. Spoon vegetable sauce over pasta. Cover tightly with foil; bake 20 minutes. Uncover; sprinkle with cheese. Bake uncovered 5 to 7 minutes longer or until cheese is melted. Put this together the night before. Then, bake it the next night for dinner. Since it will be cold, bake it about 10 minutes longer before topping with the cheese.